Highlighting Scotland’s use of renewables, the BBC show Newsnight visited an ice cream manufacturer which produces carbon neutral confectionery. Monday’s edition of the programme featured Mackie’s of Scotland, an ice cream manufacturer in Aberdeenshire which produces 10 million litres of ice cream every year, all through wind energy. Mackie’s started off with one wind turbine initially, which was installed at its farm in 2005. Two years later, the company added two more wind turbines. Together, the three turbines have the capacity to produce 2.5 MW of power. The company produces almost three times as much energy as the business uses, and the excess electricity is sold back to the Grid. 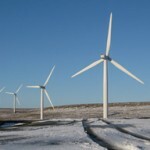 Regarded as the windiest country in Europe, managing director Mac Mackie believes Scotland is capable of reaching its ambitious target to become 100% renewable by 2020. The commitment to becoming self sufficient in renewable energy is extremely important to Mackie’s and is part of their aim to become the greenest company in Britain.